Edelbrock Pro-Flo 2-Piece Header - Dezod Motorsports Inc - Home of the automotive performance enthusiast since 2002. The Edelbrock Pro Flo 2-Piece Headers are designed for Honda/Acura engines, including JDM spec engines. The header design has been R&D tested on many well known daily driven 12 second all-motor cars, as well as 11 second naturally aspirated track vehicles. Gains on a stock motor over the OEM exhaust manifold are 6 HP the wheels while retaining the stock cat-back exhaust system. The header has supported over 250+ HP the wheels with optional race B-pipe. Available in 3 finishes which include polished 304 stainless steel, unpolished 304 stainless steel, and ceramic coated mild steel. 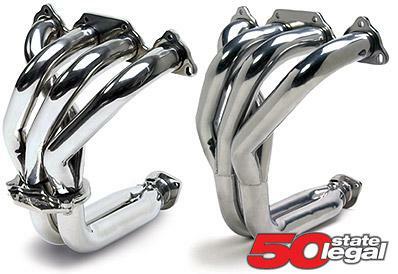 These headers offer outstanding performance and sound over all other competitors.